This compact dual-monitor docking station for laptops is uniquely designed with an innovative, stacked-port layout and a small foot-print housing. Because it occupies less surface area than traditional laptop docks, you can easily integrate this sleek docking station into an area with limited desk space, making it perfect for hoteling or hot desk environments. 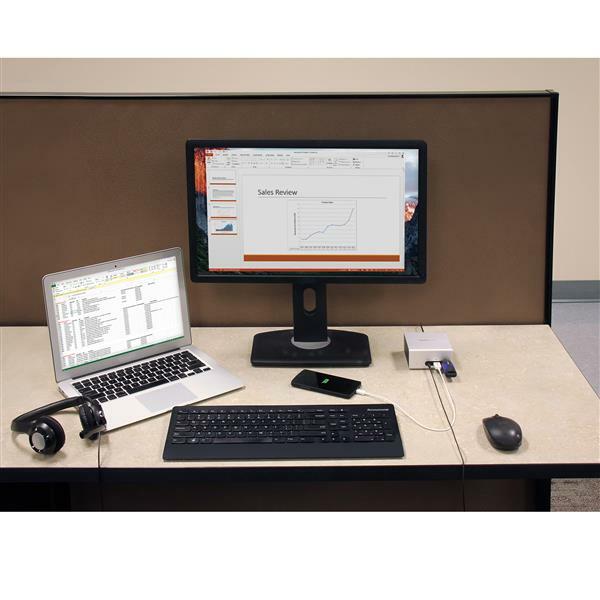 Using just a single cable you can create a full-size dual-display workstation without sacrificing functionality due to space constraints. Now you can increase your productivity by accessing more displays at once. It's an ideal solution for a wide range of conventional and specialized environments. 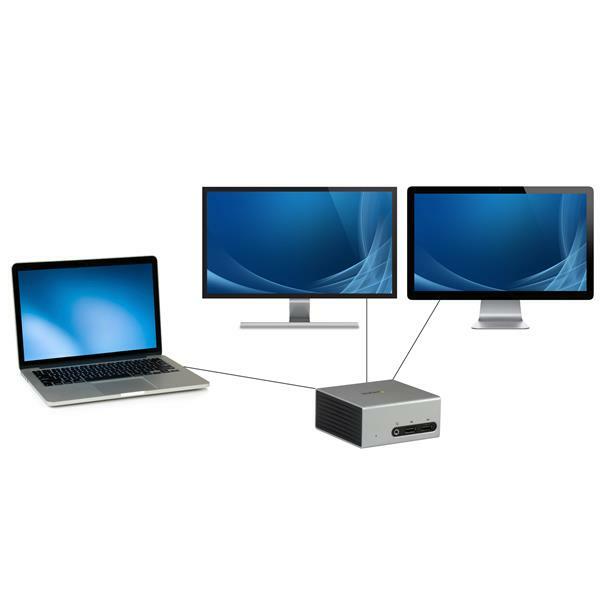 The docking station makes it easy to turn your laptop into a highly productive dual-display workstation, by expanding your screen space onto an HDMI® display and a DVI display. The additional screen space lets you work more efficiently, because you won’t have to flip back and forth between pages or windows. 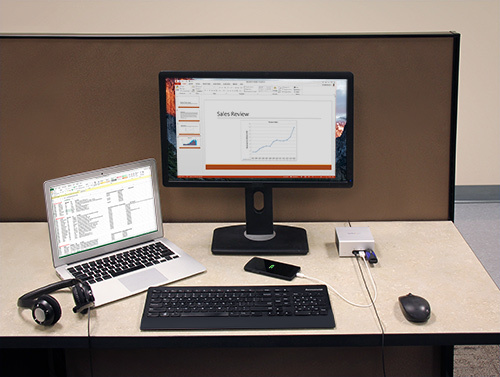 Plus, when combined with your laptop display, you can create a triple-monitor workstation. 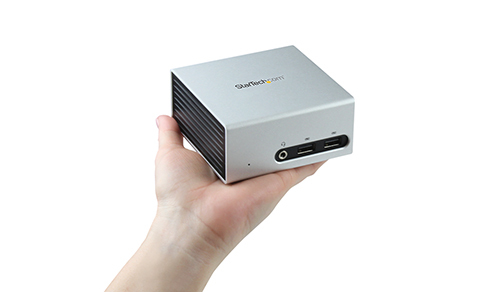 This docking station can also bolster your external display image quality and increase your overall viewing area, making it ideal for video editors, animators, designers, and more. It supports 4K x 2K (3840 x 2160p - 30Hz) resolution on a single HDMI display, even if your laptop doesn’t natively support 4K output, so you can avoid costly hardware upgrades or laptop replacements. 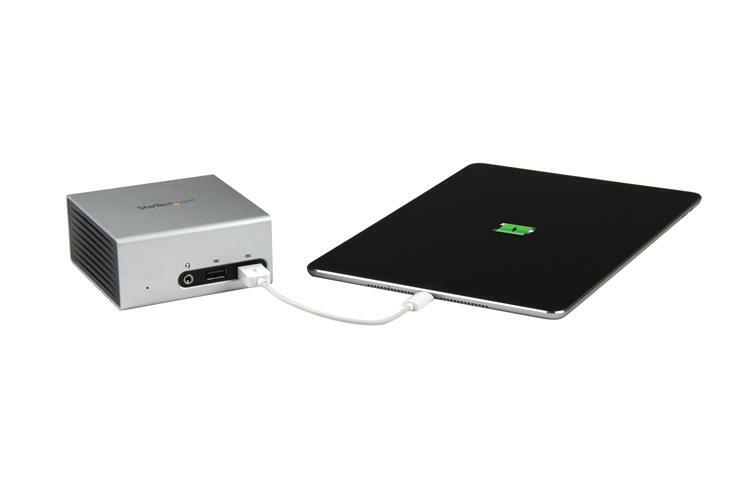 With two possibilities for video output, this docking station is a handy accessory for users in business and home office settings, and BYOD (Bring Your Own Device) applications. This small form-factor docking station lets you save desk space without compromising the ports you expect from a typical laptop dock. Unlike some compact laptop docks that only offer basic connectivity, this dock occupies minimal space while delivering all the functionality of a full-size docking station. 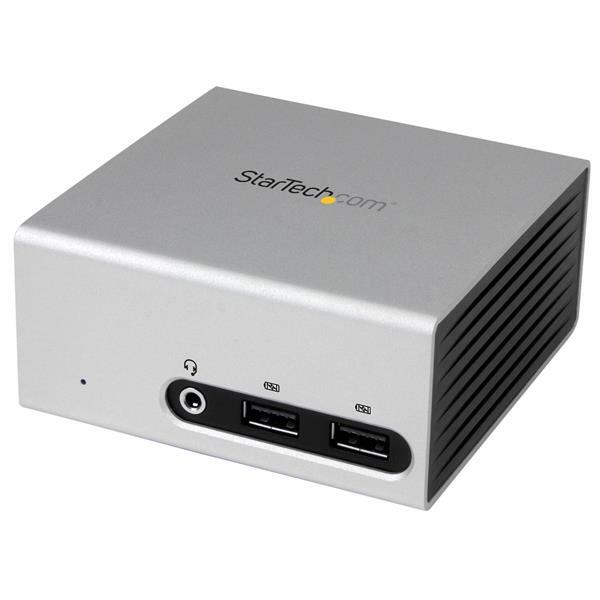 Because of its compact size, the dock is ideal for office hoteling, or hot desks. You can start work faster and reduce cable clutter in tight spaces by leaving your peripherals connected to the dock at all times. Plus, setup is fast and hassle-free, so there’s little disruption to your productivity, making it perfect for single users, or multiple people who use the same workstation at different times. 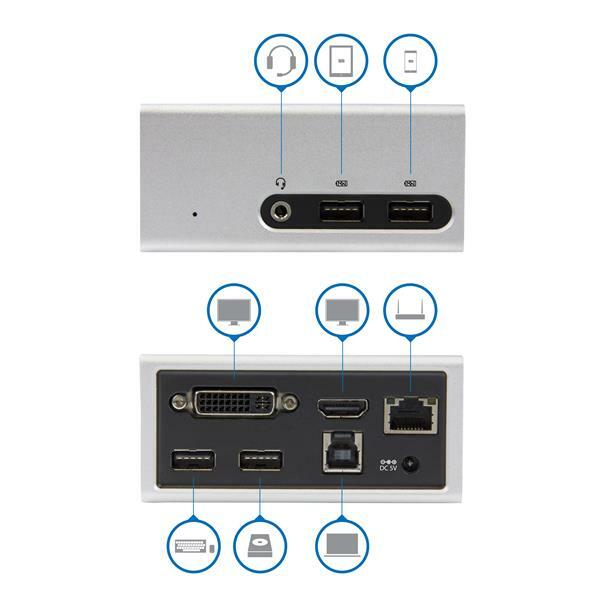 The USB 3.0 (also known as USB 3.1 Gen 1 - 5Gbps) docking station for laptops offers a variety of other connections that are often missing from port-limited laptops. To make work easier, the versatile dock offers four USB 3.0 ports, giving you plenty of ports to connect even more USB devices. You can keep your mobile devices fully charged and ready to go using the dock’s convenient, front-panel USB fast-charge and sync ports. You can also keep your smartphone and tablet within arm’s reach, and the always-on ports will be available even when your laptop is disconnected from the docking station. Unlike some proprietary docking stations designed only to work with specific laptop models, this universal laptop dock works with multiple brands. All you need is your laptop’s USB 3.0 port and you can be up and running quickly. With universal support, you can use this dock with different laptops now, or in the future. The USB3SMDOCK4K is backed by a StarTech.com 3-year warranty and free lifetime technical support. Extended displays are currently only supported with DisplayLink-based products on macOS 10.11 to 10.13.3. This may change in future versions.